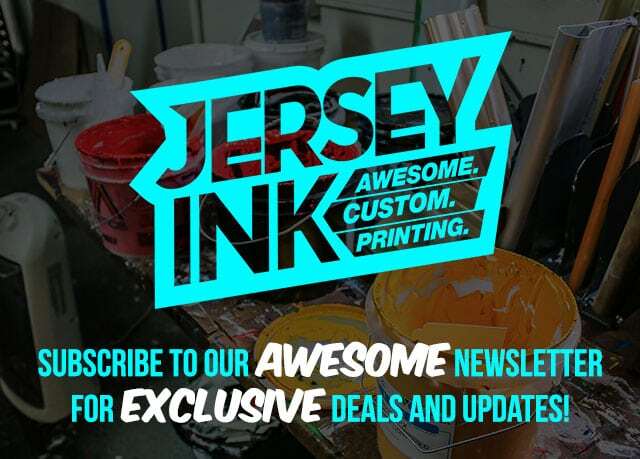 Jersey Ink specializes in screen printing for projects supporting all kinds of creative and professional endeavors. Not only do we offer a broad selection of imprintable apparel and products, but we always take the time to offer our advice and guidance before sending your project to print. Have an idea, but don’t have any artwork yet? Need a little inspiration? We’ve got you covered. Quantity, Style, Color, Sizing, and Project Deadline. Don’t worry if you need assistance figuring out your specific project needs we offer free project consultations. Nothing at our shop goes to press without your approval. After we come up with a design concept we will send you a virtual mockup to ensure you are getting exactly what you want. After we receive the green light from you, our design team goes to work, printing all apparel in-house by hand. Once your order is complete you can swing by the shop, request local delivery, or have it shipped for free if your order is over $150. In 2006, Jersey Ink was founded by Susan Becker with the help of her children. From their humble beginnings in the family basement to running a full-blown studio space with a showroom in Downtown Reading, the Beckers are always willing and ready to expand and take on the next big challenge. We’d love to hear from you. Please let us know how we’re doing and leave us a review!